LEGO Shop@Home managed to get some MINDSTORMS Black NXTs, back into Europe. Thus since this week, the Special Edition Black NXT is available for ordering from S@H also at European countries (also valid for Australia and New Zeland). After a small mistake at some countries, it is now tagged for 149,99€. In my opinion the best color fit, for a TECHNIC model. Thus a must have! Hurry up, before it sells out. 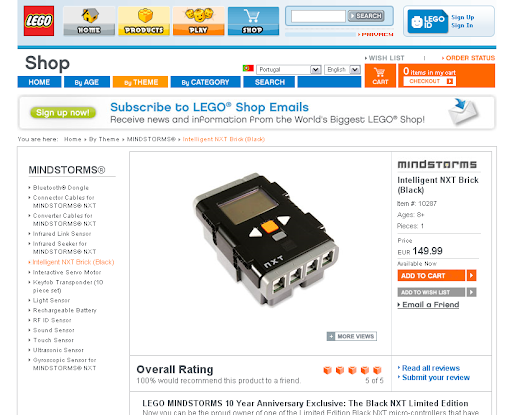 As you might remember, this a limited series of 1998 units (because it celebrates the year when the original MINDSTORMS, was released). I still have mine sitting in a box in my desk drawer at work.. wonder if I should use it or save/sell it? And I've ordered a 2nd one, just before getting to know it was going to be available directly in Europe. It seems already gone, indeed! However it also sound a bit strange. When the product finishes, it usually says "Sold Out" for some time. And in the present case is says "Sorry, item is not available in this country: [Country Name]. ", as like it was never available before... ?? ?